Last week, pup Astrid got to try out some new goodies as part of the Chewy.com Blogger Outreach Program. Now, today, it's the kitties' turn! 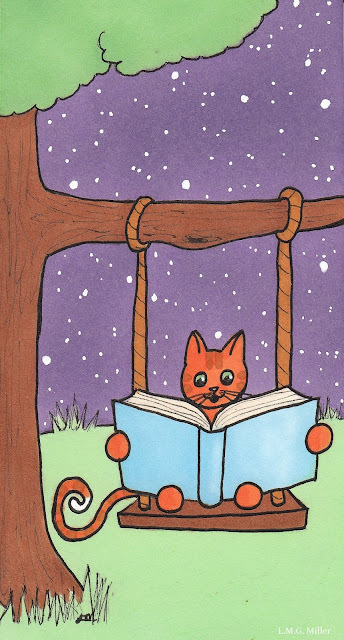 So, what did the kitties try out this month? The kitties around here tried out Taste of the Wild Rocky Mountain FelineⓇ canned cat food, with salmon and roasted venison in gravy. Real salmon is the first ingredient, and offers omega-3 and omega-6 fatty acids to support healthy skin and coat. This is also a grain-free food, and contains no artificial flavors, colors, or preservatives. I won't lie, I took a bit of a risk in having my kitties try out this food. The main reason is that my cats (or at least the adult kitties) much prefer food of the paté variety. Around here, chunky food is most often deemed some sort of sacrilege. Then again, though, that's not the case 100% of the time. So, I thought we'd give something new a shot. Don't worry, though. I knew that if this food was not received well in my house, it would be put to good use by the neighbor cat, strays, and ferals that I feed outdoors. Those kitties are not the picky sort. That all being said, what did my kitties think of the Taste of the Wild Rocky Mountain FelineⓇ canned cat food? Evan, quite blurrily, sniffed the food and walked away. Oh, and Thimble did the exact same thing. Toby, though, he actually really enjoyed the gravy in this food. He never once even thought of putting one of those chunks of actual food in his mouth, but he licked that gravy right on up. The last of the big kid kitties, Eddy, simply refuses to eat moist food. So, we'll leave her vote out of this. But, that's not the end of the voting just yet. Little calico kitten Tonks, the resident food fiend, quite enjoyed eating more than her share of this food. So did her sister Winky. Oh, but someone else wanted sneak into this review, too. Believe it or not, Astrid refused to steal this cat food. She is one picky pup, and her pickiness extends to cat food as well. But, though pup Astrid and all the adult cats around here refused to make a true meal out of the Taste of the Wild Rocky Mountain FelineⓇ canned cat food, the kitties whom we feed outdoors are getting their fill of it. Just like kittens Tonks and Winky, our strays and ferals quite enjoy it. We hope you all have a terrifically tasty Tuesday! I'm pretty sure I've drawn dozens of versions of this exact doodle. I hope you all don't mind the repetition. I just really have a thing for kitties and books. Today's tip in our litter box series is all about cleaning that litter box. A clean litter box is very important for keeping your cat healthy and happy. Cats are very clean and particular creatures, and so a dirty box might drive them away from using it. That is why an unclean litter box is one of the primary reasons why some cats begin urinating or defecating outside of the box. So, as you all certainly know, be sure to scoop the litter box, or boxes, regularly. Scooping once a day is recommended, but more often, if possible, is of course even better. Twice or three times a day helps keep the litter box odors at a minimum, and of course helps your kitty stay healthy, happy, and with somewhere clean to use the restroom. You may also need to alter the number of times per day you scoop based on the bathroom habits of your particular cat, or cats. Some cats only go once a day, and so once a day scooping would likely suffice. For cats who go more frequently, though, more frequent scooping is of course a better option. Cleaning a litter box doesn't just stop at scooping it, though. Doing a full clean of the box, which involves disposing of the old, dirty litter and scrubbing the box down, is also recommended on a regular basis. The frequency of a full litter box clean might vary, depending on your particular cat's bathroom habits, and even depending on which professional you might ask about this topic. If possible, try doing a full clean of the litter box once a week, to keep the box squeaky clean and your kitty healthy and happy. If that's not possible, perhaps at least try for once a month. After disposing of the old litter in the box, you can scrub it down with a safe cleaner. This might be warm water with dish soap, vinegar and water, baking soda and water, or another pet-friendly cleaner that you are certain will not leave behind any harsh or hazardous chemicals. Once the litter box is dried, you can add fresh litter, and even a bit of baking soda or other pet-safe deodorizer. Litter box cleaning may not be a desirable chore, but it's a crucial one. To prevent your kitty from avoiding the litter box, or from simply having to suffer the discomfort of using a smelly bathroom, be sure to keep the box nice and clean. So, do at least daily scooping, and roughly weekly scrubbing, and your kitty will likely be very happy with you. Evan decided to use this Mancat Monday to share some more of the sleepy shots he snapped during yesterday's selfie photo shoot. Before he shares these shots, Evan wants to know if any of you friends of ours ever have to get your paws involved during nap time? Evan does. Those paws can make for great pillows, eye masks, earmuffs, and all sorts of handy things like that. Do you ever use your paws as any of those things? Sometimes you even need to use your paw as a sniffer blocker. You never know when an unsavory smell might waft your way during a nap. Better safe than sorry. Well, Evan woke up just long enough to tell me to wish you all a magnificent Monday! We're still in the midst of our series of tips on the topic of litter boxes. Today's tip in this realm of things is one that we might not always think on too much, and that's the litter scoop. You'd think a scoop is a scoop, but sometimes one scoop simply might work better than another. Depending on the type of litter you use, your particular furbaby's litter box habits, and other such factors, be sure to select a litter scoop that removes as much of the piles of urine, feces, and affected litter as possible. If too much of these bits of debris are left behind when you scoop, that can lead to lingering smells and less sanitary conditions. This could in turn mean that the litter box will need to be cleaned more frequently than might be expected. For the above reasons, when selecting a litter scoop, consider factors such as the number and spacing of the grates on the scoop. In addition, you also might want to consider the material out of which the scoop is made. If there's a chance your litter scoop might get bunged up, for example, perhaps go for a metal scoop. This is because plastic scoops are far more likely to end up with scratches on their surface, and such scratches could harbor microbes, especially when used in an environment such as that of a litter box. So, don't forget to give even that scoop a bit of extra consideration and attention. Every little detail could potentially affect our kitties and their health and happiness, and that even includes the litter scoop, which helps keep that litter box as clean and sanitary as possible. Evan spent some extra time trying to set up the camera for a purrfect selfie today. By the time he got it all situated, though, he was so tired he fell right asleep! It looks like Evan's selfie turned into an Easy Sunday shot. Zzzzzz. 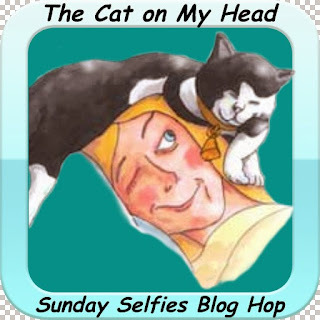 Regardless, these were Evan's attempts at joining in on the Sunday Selfies blog hop, hosted by the Kitties Blue over at The Cat on My Head. Our newest series of bookish doodles continues today. This one is brought to you by Angel Rosie. Today's (overly lengthy) tip in our litter box series is about selecting the type of litter. There are many, many kinds of litter out there. There's clay litter, corn litter, wheat litter, pine litter, litter made out of recycled paper, and even litter crystals, just to name a few. There are even choices such as scented versus non-scented litter, litter for single-cat versus multicat homes, and clumping versus non-clumping litter. The options for litter seem to be endless, which can make the task of choosing one a tad bit of daunting. So, let's go over some of the factors that will help you select a litter. To begin, first and foremost, let's go ahead and repeat ourselves like the broken record that we are—ultimately, your kitty will have the final say on what type of litter you buy. Cats can be very picky, particular creatures. Some have texture preferences, some have scent preferences, and some have any number of other preferences. If your cat doesn't like the litter you choose, they might avoid the litter box, which is in large part why they ultimately get to choose their litter. The above being said, what are some of the main factors that might go into choosing the right litter for your kitty? Consider, of course, the type of material out of which a litter is made. For example, clay litter is often one of the dustiest, which may not be ideal for a cat or person with asthma. Also consider whether your cat has any other sensitivities or allergies. To give you an example, I once tried my angel cat Rosie on pine litter. Little did I know, pine was not a substrate Rosie's body tolerated well, and she ended up with hot spots that required steroid and antibiotic treatment. So, especially if you are trying a new type of litter, always keep an eye on your kitty to make sure they do not have an adverse reaction, and also that they do not start avoiding the litter box. There are plenty of other random yet important factors to take into consideration when choosing litter, though. Do you have multiple cats? If so, perhaps look for a litter that is formulated for multicat homes. Does your kitty leave quite the stinkers in the litter box, and so you've chosen a scented litter? If this is the case and your cat uses the litter with no issues, then that's great. But, do keep in mind that cats' noses are far better than ours, and some cats might not like fragrance in their litter. Your cat might very well let you know if they do not like scented litter by avoiding the box, in which case you'll get the hint. We're not done with this discourse quite yet. As we touched upon earlier, some cats have texture preferences. Since litter touches their paws, such texture preferences can of course play a large role in what type of litter your cat might use. For example, some cats prefer fine litter, and will not touch litter that is more coarse. I will also add here that I have some family members with cats who do not like litter at all, and so they use pee pads in litter boxes, which works great for those particular cats. Then again, my own Evan, in large part due to his hind limb paralysis, is towel trained rather than litter trained. So, litter texture can be a significant consideration for some cats, and in such cases there may indeed be some trial and error required. In such cases, just be patient, and you and your cat will find a litter, or even a litter alternative, that suits everyone involved. Of course, that there bookworm kitty on the lake is our contribution to Athena's Caturday Art blog hop. Don't forget to visit Athena to see the art all of our friends have created! We're continuing on with our litter box tips today by discussing location. When deciding where to put litter boxes in your home, there are a variety of considerations to make. For example, you cat likely won't want to do their business in a high traffic area, where there are many distractions and little to no privacy. At the same time, though, many cats will also likely not want to be hidden away in an small, enclosed area, such as a small closet. Placing a litter box in a small, enclosed area such as a small closet will likely trap the smell, which some cats are averse to. What's more, using the litter box is one way in which cats often instinctively believe they are making a territorial display, and so hiding away the litter box, where no one can see them do their business, might lead to out-of-box behavior for territorial reasons. All of the above being said, consider where in your home might work best for a box to be both away from heavy traffic, yet close enough to the goings-on for your kitty to still feel included. Dedicated litter box rooms, corners of bedrooms or living rooms, bathrooms, laundry rooms, or even large closets with their doors kept open, can all make for good litter box areas. It really depends on how your home is set up, and where your kitty might feel most comfortable. Just as we've mentioned before, though, it also might simply come down to your cat's preference. Perhaps your cat enjoys using the restroom right in front of you, or perhaps your cat actually prefers to go in a closed closet. In the end, if your cat displays a preference for litter box placement, try your best to stick with that. We'll also now mention that, when selecting litter box location, also take into consideration how many cats you have. In homes with many cats, it is often ideal to spread litter boxes throughout the house, as best as possible. This is especially the case if there is any bullying amongst your cats. If all of the boxes are in one room, a bullied or timid cat might prefer to steer clear of using the restroom with other cats nearby, and therefore might begin out-of-box behavior elsewhere in the house. They even might simply hold their urine, which can lead to a variety of medical issues. So, especially in multicat homes, do consider the number of and comfort of all cats when deciding how few and far between to place the litter boxes. Then again, this consideration also might be important for even a single cat who is geriatric or has issues with mobility. For such a kitty, having multiple litter box options, in areas of the house where they most often hang out, can help them more easily urinate and defecate when and where needed. There sure are a lot of considerations to make when it comes to that litter box. You of course have to choose a type of box, as well as how many. Once you have that settled, it's all about deciding where to place the litter boxes in your home. Fear not, though, as you and your kitty, or kitties, will figure it out. If nothing else, trial and error will often lead your kitty to letting you know what he or she prefers. Who's ready for the Friendly Fill-Ins? We are! In case you missed the fill-ins yesterday, you can find them below. Ellen of 15andmeowing came up with the first two, and I came up with the second two. 1. I deserve a gold star for _________ today. 2. Right now, I am loving _________. 3. The best advice I've ever been given is _________. 4. If I had to choose a new first name, it would be _________. As always, I took my turn to fill these in, too. 1. I deserve a gold star for successfully dodging five piles of cat puke in a dark hallway today. 2. Right now, I am loving the show Nailed It! on Netflix. 3. The best advice I've ever been given is, "Do something because you enjoy it, not just because you're good at it." 4. If I had to choose a new first name, it would be Autumn. 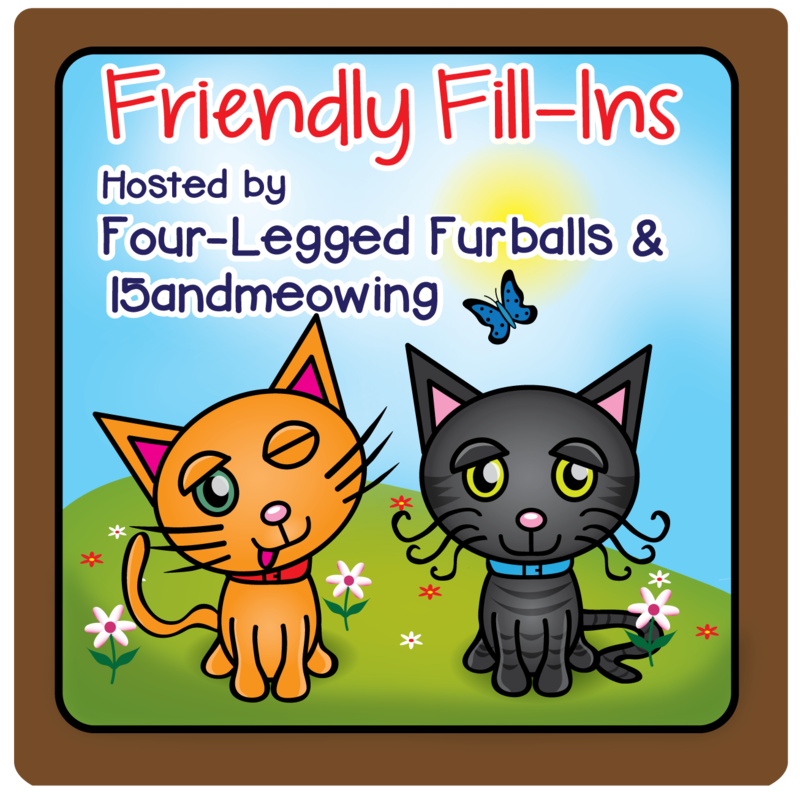 To add your link to the Friendly Fill-Ins Linky list, just click HERE! You can also click on the badge below to add your link. or in the comments on Ellen's blog, 15andmeowing. Are you ready for your Eddy fix? Luckily, today also happens to be the day of the Pet Photo Fails, a blooper bog hop hosted by The Cuddlywumps Cat Chronicles. And so, here's Eddy doing what she does best—creating bloopers! Have a fun and fantastic Friday, friends! 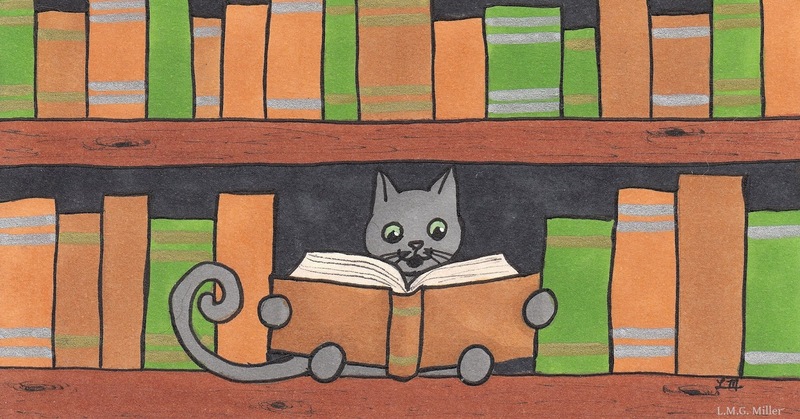 I guess I'm in the mood to scribble up some more bookish doodles. Hopefully you all don't get tired of me drawing books, because that seems to be happening a lot lately. 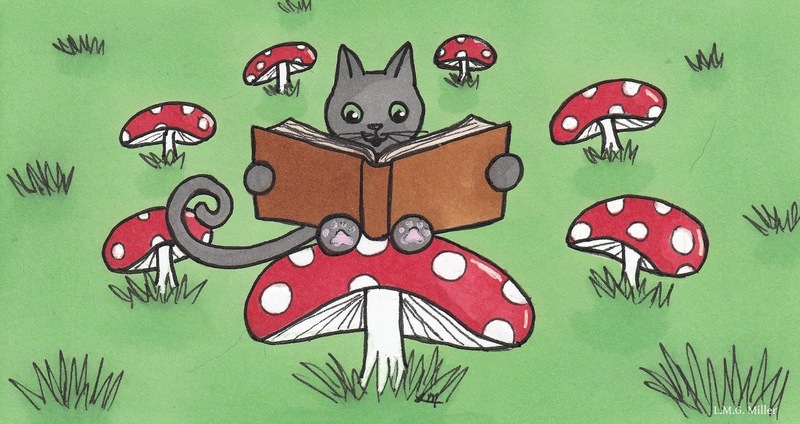 I also seem to have a thing for toadstools, but I'll try not to include those in every single upcoming bookish doodle. As we mentioned yesterday, we're doing a series of tips dedicated to none other than the litter box. Yesterday, we talked about choosing a type of litter box. Today, we're going to talk about the number of litter boxes you might need. That up there is the general rule for how many litter boxes a home should have, for the comfort of the kitties living there. Since we're a broken record, we'll say it again: the number of litter boxes should equal the number of cats, plus one. This general rule helps ensure that all of the cats in a home have plenty of options, something that is especially important in a multicat home. Finding a clean litter box, and not being bullied out of it, is more easily done when there is a sufficient number of boxes. As for single cat homes, the equation above still typically applies. Why? One reasons is that some cats don't like to urinate and defecate in the same box. Another reason is that, again, it gives them more options for a clean box, and can thereby reduce potential out-of-box behaviors. Now that we have that little equation out of the way, we'll also mention that it's possible that not all of the litter boxes in a home should be or will be the same type. For example, do you have one cat who likes covered boxes, and another cat who prefers uncovered boxes? If so, then you should probably have litter boxes of both of those types. This ensures that each cat has a choice that suits their preferences. So, it's not only important to ensure that there are enough litter boxes, but that the boxes suit the needs of all cats present in the home. It's that day of the week again. You know, Thursday, the day we rhyme. It is, after all, time for Angel Sammy and Teddy's Thoroughly Poetic Thursday challenge! For this, Sarah was willing to make a long drive. But Sarah had been waiting for this since she was four. Perhaps this discourse needs a bit more explanation. Sarah would finally be viewing the most famous show in the nation. That show was none other than Cats! Surely you have heard of that. On her legs even donning those less-than-cozy hose. For it was the possession she presently prized the most. Sarah hopped into her little old truck. It sputtered, chugged, and stalled. Sometimes it barely even ran at all. For the show ahead was bound to be a hit. But Sarah was glad for its trusty survival. To the theater where she would watch a tale most dear. And her excitement she simply could not hide. She impatiently waited for the show to begin. When the curtain drew back, her face lit up with a grin. At first the stage remained empty as could be. No actors, at first, did the audience see. The sight of it eliciting gasps of shock. "What in Sam Hill is this?" someone did spew. At the very same time, that first actor let out a mew. It was a line spoken with pure authenticity. After all, this actor was a furry, full-tailed kitty! The cat sauntered right on over to center stage. Right then and there it went on a tail-chasing rampage. And so it curled up and fell into a nap. Sarah immediately clapped and smiled. This is exactly what she had been waiting for. No wonder critics gave this Cats such a high score! Half a dozen more cats appeared for their parts in the play. Just look at that kitty over there licking its bum! And another cat nearby batted around a crumb. But only to hack it and a hairball right back up. This was even better than Sarah had ever expected. The kitty characters had their parts more than perfected. Sarah cheered as one kitty clawed its way up the big red curtain. It made it to the top in record time, for certain. And it immediately became all the rage. Trying to catch the roles played by each and every cat. She did not want to miss one second of this show. It was already so wonderfully keeping her on her toes! Two great big tabbies began hissing and growling. The crowd around Sarah was clearly judging and scowling. When one tabby turned and slapped a cat deeply napping. After that, the chase was on. 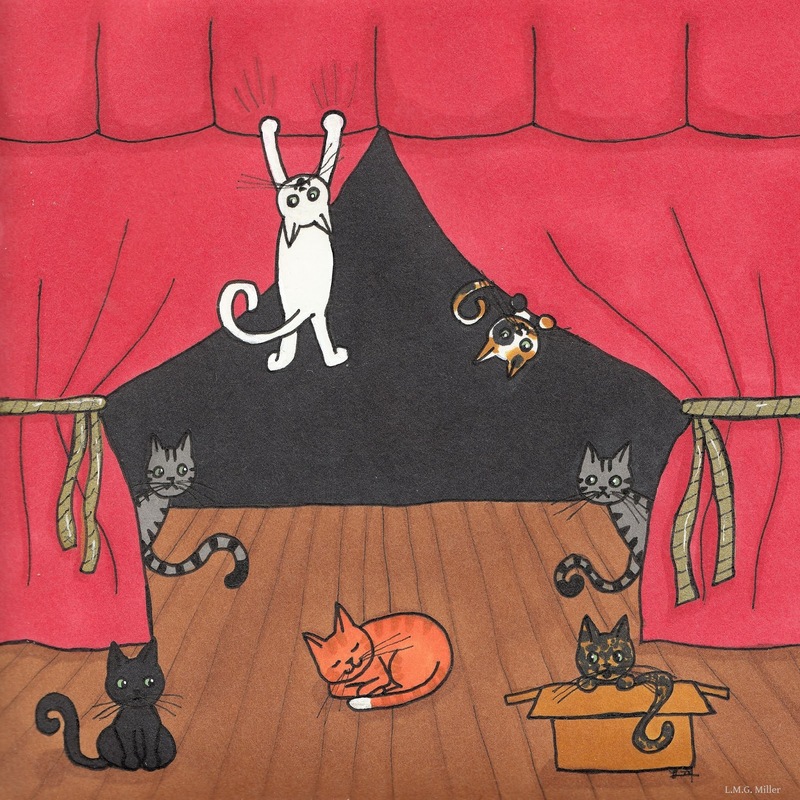 Into this race, every cat on stage was drawn. The cats on stage numbered at least forty. 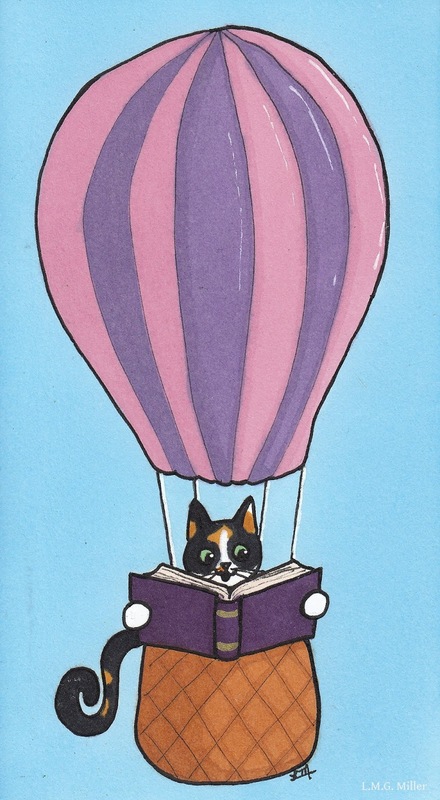 Until a little calico surged ahead in the chase. But never once did her pace even begin to stall. So that right into the crowd the little kitty did fling. People scurried and ran as the whole cast of cats flew off stage. In their giant game of tag they were all still quite engaged. The cats scaled and jumped off of those in the crowd. The screams that ensued were really quite loud. Sarah knew not why the folk around her acted so appalled. They were watching the best ever showing of Cats, after all! Today, just as with every Thursday, Thimble is now here to show you just how cute she is, and to participate in Brian's Thankful Thursday Blog Hop. As a preface, Thimble helped model something for which this mom here of hers is very thankful. And that is, recently being a winner over at The Cat on My Head, where I won a pair of kitty socks from Our Sock. As a winner in this giveaway, I got to have an image of one of my kitty's heads put onto a lovely pair of socks. I had no trouble choosing which kitty would be on my first pair of socks from Our Socks. Can you see past Thimble and that glaring sun to recognize that beautiful calico kitty on the pretty pink socks? It's my angel Rosie! Truth be told, I've been eyeing the socks over at Our Socks for quite some time now. I plan on getting a pair for each of my furbabies over time, but I already knew that, when it came time for my sock collection to begin, my sweet angel Rosie would most certainly be the first one to adorn a pair. I was so happy and grateful to win the giveaway over at The Cat on My Head, because now my collection has officially begun. Thank you so much, Kitties Blue! Thimble insisted she model the socks in every shot I tried to take of them. Thimble truly believes that no shot snapped by a camera should exclude her. Let's be honest, I won't be wearing these socks. They're just too pretty and purrfect to get shoved onto my feet. Instead, I'm more than likely going to frame them and hang them in my room. I've also considered hanging some sort of mock clothesline on one of my walls, from which I could hang my now growing collection of furbaby socks. Either way, these socks will be a wonderful addition to my collection of Rosie images and art. 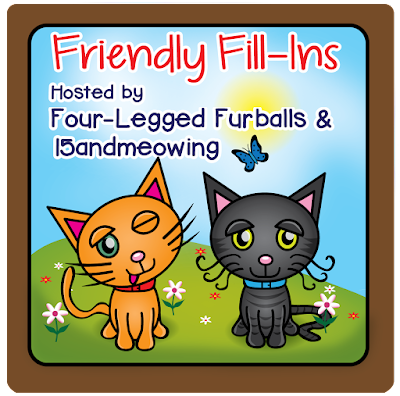 Tomorrow is the Friendly Fill-Ins! So, today we have the fill-ins to help you prepare. Ellen of 15andmeowing came up with the first two, and I came up with the second two. We'll see you tomorrow, friends! We've given tips here and there on cats and their litter boxes. The litter box plays such a crucial role in not only your cat's daily life, but also their health and happiness. That's why we've decided to do an entire, comprehensive series of tips on that box of litter. The first tip in this series is all about selecting the type of litter box. You wouldn't think a litter box could come in all that many varieties, but the litter box aisle at the pet store begs to differ. Litter boxes come in all sorts of shapes, sizes, and configurations. That means there are a lot of considerations to make when selecting that litter box. So, let's start with size. Is your cat of the larger variety? Especially in the case of a large cat, it is important to make sure the litter box is big enough. Out-of-box behavior, even if in the form of accidental misses, can occur if the box is too small for the cat. Sometimes, you'll even need to make sure to get a box that is not only large enough but that also has tall enough sides. Some cats are more prone to raising their rear end when urinating, for example, which would mean that a box with tall sides is a far more ideal option. The above being said, also take into consideration if your cat is small. If you have a petite cat or a kitten, you might at least have to start with a small box. Being able to climb over the edge of the box in order to get inside is of course important. A kitten might very well outgrow their first litter box, but when they're small, they of course need to be able to comfortably climb into the litter box. In truth, though, no matter the size of your cat, stick to whatever size of box they seem to prefer and do well with. Some cats might be large, but also might prefer and do just fine with a small box. Take any such preferences your cat has into consideration. There are also different shapes of cat litter boxes. There are rectangles, squares, circles, ovals, and even some triangular ones that can fit into corners. When selecting the shape of the litter box, you can base your decision on concepts such as how the shape might affect your furbaby's ability to get comfortable when in the box, or how the shape might affect the way it fits in your home. Then again, as mentioned above, your cat might reveal a preference for litter box shape, and if so, go with that. Next up is an oft debated litter box detail. And that is, do you get a covered box? Or, do you get an uncovered box? Let's go right ahead and touch upon the fact that, ultimately, the cat gets to pick. Some cats prefer a box that is covered, such as for the sake of privacy. Other cats do not like covered boxes. That being said, covered boxes can harbor smells far more easily than uncovered boxes. Imagine walking into a portable toilet, one in which all of the smells just sit and fester. No one enjoys using a portable toilet, and that might be how some cats feel about a covered litter box. Again, though, the truth of the matter is that the cat should get to pick what kind of toilet they use. If your cat will not enter or use a covered box, but will willingly urinate or defecate in an uncovered box, then an uncovered box it is. If your cat urinates or defecates outside of an uncovered box, but will willingly go into a covered box and use it, then no matter what your thoughts on this topic are, your cat just gave you their answer. So, when it comes to selecting the type of litter box your cat will use, of course take into consideration their size, whether the box will harbor smells, and other such details. That being said, though, just like us, our cats often have preferences and opinions on various matters. The litter box might very well be one of these matters. That's why, when it comes to any of the details of the litter box, if your cat shows a preference, take note of that and run with it. 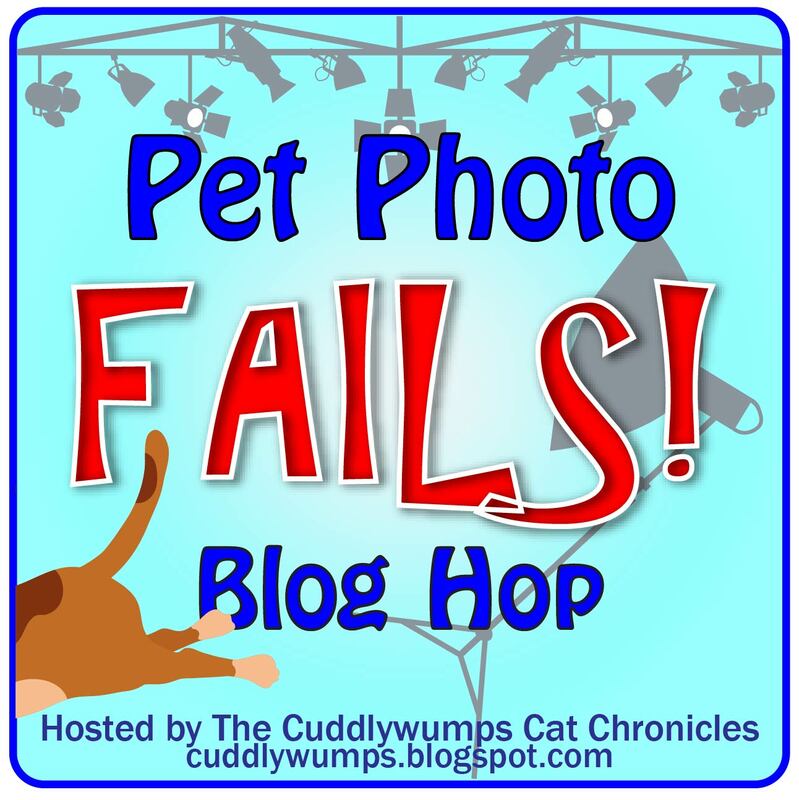 We're a bit late to the game this month, but we're here today with pup Astrid's review for the Chewy.com Blogger Outreach Program. We typically strive to try out items that are new to us, but this time around, we went with something familiar. As you can probably tell, these are Rachael Ray™ NutrishⓇ Burger Bites, and Astrid absolutely loves them. Astrid is a finicky girl, so when we find a food or treat she likes, we are super excited. So, when I saw these on the list of Chewy.com review items for this month, I decided I simply had to let the picky pup in my life go for one of her familiar favorites. This here mom to Astrid quite likes that these treats are made with real beef as the first ingredient. And that beef is even farm-raised right here in our very own USA! These burger treats also contain no grains, corn, wheat, artificial flavors, or meat by-products. Oh, and they're also a good ol' soft and chewy texture, which is Astrid's absolute favorite kind of treat. Oh, hello, Astrid. Are you expecting a taste or something? Sometimes this pup gets a little impatient when I'm photographing her goods. Humans are so slooooooow, you guys! Astrid also wanted to make sure Evan didn't steal any treats out from under her nose. We thought we'd give you guys a hardy dose of bloopers. We hope you enjoyed. In case you were wondering, yes, this pup still loves her Rachael Ray™ NutrishⓇ Burger Bites! Happy Astrid had more than her fair share of these goodies, and she most definitely gives them 4 paws up. Today is July 25th, making it the true Christmas in July! 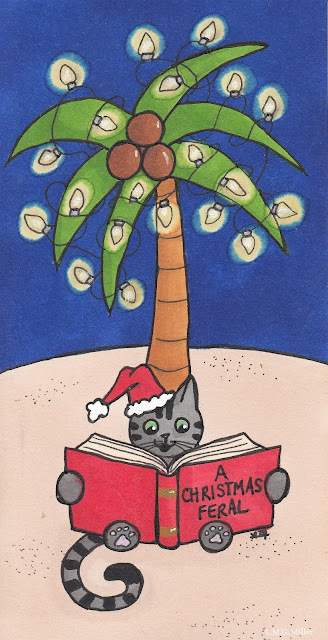 That means today we are sharing our last doodle in our Christmas in July series. At least we're already less than halfway to the December version of Christmas. Merry Christmas in July, friends! 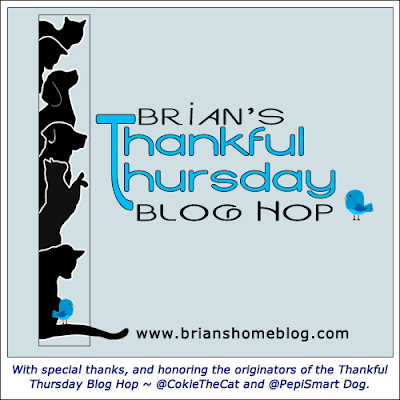 If you ask our humble opinion, having kitties and a pup in the same home can be a wonderful thing. It's even better when they all get along. Sometimes, though, the biggest trick is getting a pup to leave the kitty food alone. There are some methods to try, though, if you find yourself in such a situation. First, you can try placing the cat food somewhere the dog cannot reach, but of course where the cat can reach it. 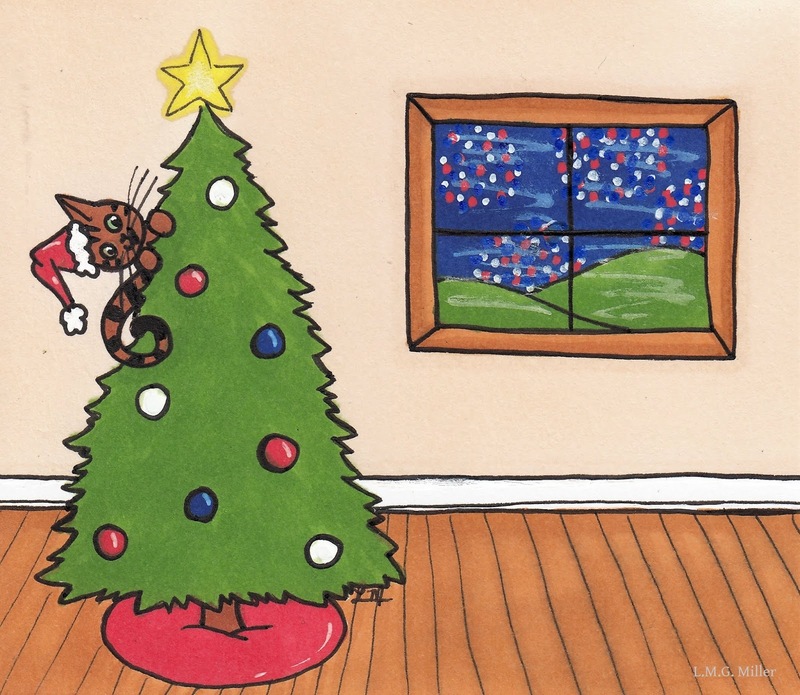 You can try a counter, cat tree, or shelf, for example, as a cat can often climb to these heights, while a dog typically remains land-bound. Another option is to get some form of sturdy box, setting it upside down on the floor, cutting a hole in it through which a cat can fit but not a dog, and feeding your cat within. There's even a chance that some pieces of furniture would allow for this form of feeding. Of course, this technique primarily works for larger dogs, as small dogs might still be able to access cat food with this method. A more fail-safe way to feed a cat without a dog's intervention is by feeding them in separate rooms. You can keep the cat's food in a room where the dog does not have access, even if just during feeding time. You can also keep the cat's food in a room that is permanently closed off to the dog, but where the kitty can visit by way of something such as a kitty door. One more similar option is to feed the kitty in a separate room where the door is left ajar, but is kept that way with some sort of door attachment. There are such products available on the market, that allow for a door to remain stuck ajar, so that a cat can pass through, but not a pup. You can even rig your own sort of setup, such as by using certain types of brackets, just as long as the setup is still safe for the furbabies. Again, though, these last couple of options will work best if the dog is larger and therefore cannot squeeze through to reach the cat food. It is more than possible to have both cats and dogs living under the same roof. Once you get past the introductions and everyone is one big happy family, sometimes the main issue then becomes keeping the dogs out of the cat food. This is an important thing to do, though, as eating food not intended for their species can potentially result in gastrointestinal distress. So, if you have both cats and dogs, and food thieves run rampant, simply think on what type of feeding method would work best for you, your furbabies, and your overall home setup. It may take some trial and error, but it is doable. Thimble is a proud tabby. She wears her stripes like badges of honor. I clearly have a thing for tabbies. Not only is my girl Thimble a tabby, but so is my boy Evan, and so is my wild child Eddy. And you know what else? Even my little calico Tonks has tabby stripes! 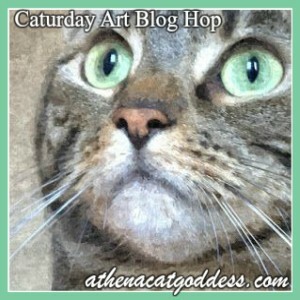 See those stripes on Tonks's front arm, and perhaps even the stripes on her face? Oh, but don't mind the human fingers intruding on the shot. Tonks's auntie had to, yet again, hold her still for this photo. I'll see if I can get a far better shot of Tonks's tabby stripes. Wish me luck. Anyway. It's all about the tabbies around here. Is it the same for you friends of ours? Is it all about tabbies in your home? Or all about torties? All about tuxies? What about calicoes? Black kitties? Orange kitties? This list could go on and on! 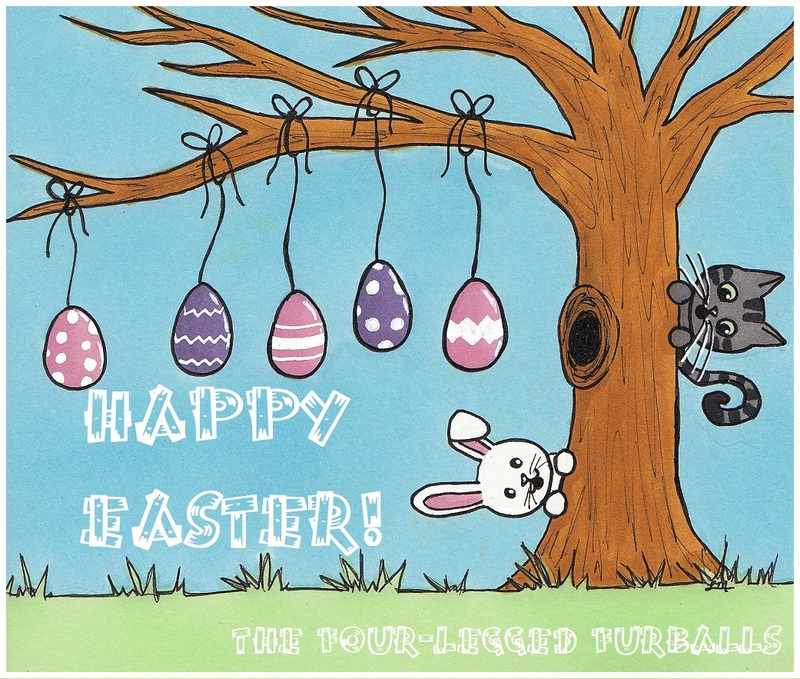 Even if it's not a Tabby Tuesday for you, we hope it's terrific nonetheless! 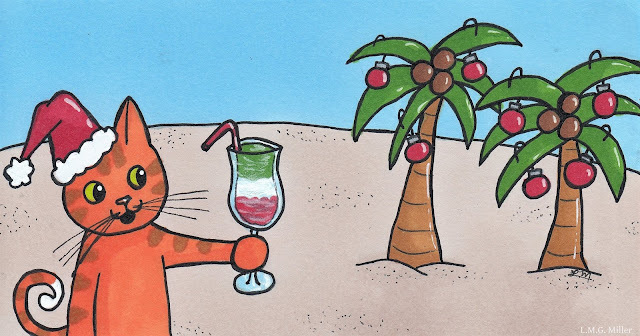 Today is our penultimate Christmas in July doodle. We decided to go patriotic for this one. Do you want or need to monitor your furbaby, even when you aren't with them? Items such as baby monitors don't have to be used for only children of the human sort. Baby monitors, or similar products, can be used for our furbabies as well. Depending on what type of monitoring you need, you can look into monitoring devices that allow you to hear, see, or locate your furbaby. For example, there are monitors and cameras that you can place in your home that allow you to view your furbaby and what they're up to, even if you're away from home, such as by using the internet, apps, or other similar means. There are even devices on the market that can be attached to your furbaby's collar and that take video of what they've been up to. Another method of keeping track of your furbaby includes more or less putting some form of tracking device on them. For example, there are GPS or other similar devices that can go on your furbaby's collar. This is something that might come most in handy if you have a dog or cat who goes outdoors. All in all, if you want or need to keep an especially close watch on your pup or kitty, such as when you're away from home, there are ways to do this. You might wish to keep an eye on a new puppy or kitten, a sick or geriatric furbaby, a cat or dog with separation anxiety, or something else along those lines. In such cases, determine whether monitoring, such as when you're away from home, might be beneficial, and then research the best types of monitoring systems for your particular situation. It's Mancat Monday! Evan wanted to snap a shot of him enjoying the sun at his beloved front door. But, then the sun tried to outshine him. This here human has relatively zero talent in photo editing. My photo viewer, though, offers some sort of autocorrect option, and I decided to give it a shot for this one. I'm not sure the corrected version is all that much better, though. There's really just no correcting my ability to overexpose a photo. Despite his photographer's epic lack of skill, Evan hopes you enjoy this sunny shot of him! 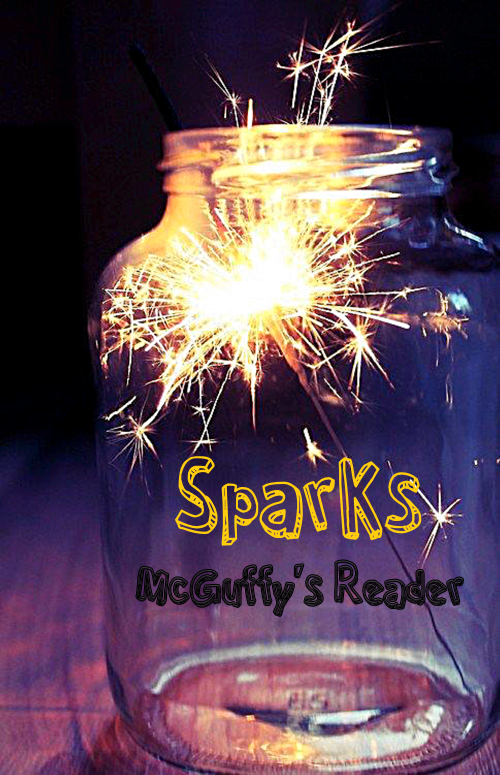 Oh, and speaking of the sun, that has a little to do with our Sparks for today. 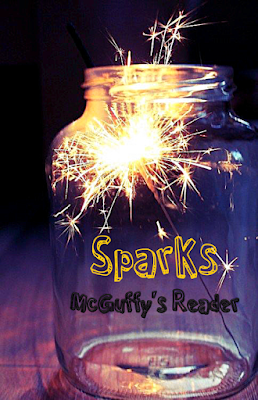 Annie of McGuffy's Reader is taking a well-deserved blogging break, but we still often feel compelled to continue on with her Sparks blog hop. With this hop, Annie intended for us to share positive thoughts in this often negative world. And so, we have a sunny thought for you today. "Keep your face to the sun and you will never see the shadows." Have a marvelous Monday, friends! Here's today's Christmas in July doodle! When there's rain rather than shine, it can often make it difficult to take our pups or outdoor kitties outside. For those furbabies who might need to go outdoors, such as for a bathroom trip or a walk, you can try to find ways to keep them as dry as possible in the rain. Did you know that there are indeed products on the market specifically designed to help keep your pups or even kitties dry? For example, there are leashes available that have umbrellas attached to them, so that your furbaby can stay dry beneath the umbrella while on their leash in the rain. In addition, there are also rain ponchos available for pets. With such products, you of course have to ensure that you get a product that matches your furbaby's size. An umbrella or poncho fit for a mastiff won't fit a small dog or cat. There are also, of course, other options for helping your furbabies stay dry when they go outdoors in the rain. You can try the simple trick of holding a typical umbrella over your furbaby. Another option is to have an area of your yard that stays dry, such as beneath some sort of canopy, where your furbaby can comfortably enjoy the outdoors even in the rain. For furbabies who might refuse to go outdoors in the rain, yet who are not litter box trained, you can also train them to use pee pads in the house if plausible or if in dire straits. So, there are a variety of ways to potentially help furbabies stay dry in the rain, which is especially crucial for those who go outdoors to use the restroom yet who also don't like getting wet. Simply take into consideration what methods might be most useful for your particular situation, and then try viable options until you find a solution that works best for your furbaby and yourself.